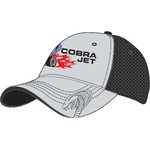 Ford's Cobra Jet-Mustang gray and black mesh ball cap, new w/tags. Embroidery of the corba on the cap and bill. Just 2 left.